This dramatic heist is planned for the jeweled Virgin Mary statues from the festival parade bull race in Pamplona, Spain. "The Dove", terror of Scotland Yard, Peter Churchman has retired quietly to a small village until nasty former team-mates Angela and Francois Morel blackmail him into planning and helping steal diamonds from the effigies stored in a bank vault. His new love, Grace, mother of three, surprises him with her talents. Other characters, some slimy, some honorable, get involved for a lively escapade and twist ending. ©1966 William P. McGivern (P)2012 Audible, Inc. This is my fourth McGivern novel. The first three, Night Extra, The Big Heat, and Rogue Cop, all written in the 50’s, are well within the Noir tradition: tough, principled cops or newspapermen facing corrupt city machines, or, alternately, a corrupt cop looking to retrieve his principles. All three are well-written, expertly paced, engaging, highly enjoyable and, at times, even moving. But the element that makes McGivern’s work stand out from standard hardboiled stories is his overt, sincere Catholicism. The reality of good and evil certainly drives the fictions of Christie and Sayers. Both were serious Christians and it shows. But not since Chesterton have I encountered an author whose works address so directly issues of faith in the attenuated moral atmosphere of police stations, nightclubs, and back alleys. I mean, where else can you find a hard-boiled cop who reads St. John of the Cross? 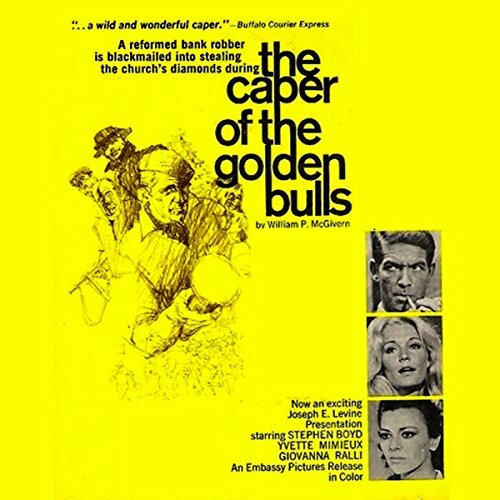 The Caper of the Golden Bulls, written in the mid-60’s, is another departure. While still seriously weighing questions of good and evil, the weighing now happens in Spain. Our hero is a retired master criminal, so successful that he even had a nom de guerre. The target is the legendary jewels bedecking ancient statues of the Virgin Mary. Just as the previous books breathed the essence of the mean streets, Caper reflects the slicker, more glamorous world of meticulously planned jewel heists, inaccessible bank vaults, exotic locations and Interpol. But at its core, this is still a story of sin and salvation. Is our hero’s name, Peter Churchman, a little too obvious? Yes. It’s so obvious Peter even comments on it. Is the incident that launched his larcenous career a little far-fetched? Yeah. But, somehow, I don’t care. What counts is that McGivern makes the counter-arguments to faith ring true. And then he lets the counter-argument to the counter-arguments play out in plot turns and descriptive details far more eloquent than any argument. And, as if that’s not enough, this is a ripping, gripping, finely-wrought story. Yes, at times McGivern over-reaches with a description or a bit of dialogue. But the attention to detail (like the smell of potted plants in a bank lobby) and his gallery of characters (don’t miss the half-mad, half-sane Morgan) are well worth the price of admission. Then there’s the way the tale is told. For example, we’re never made privy to Peter’s plans; we see him assembling the people and ordering the tools, but we only realize his overall concept as the story moves forward and the pieces fall in place. For the listener, it’s an immensely satisfying approach. The approach to the reading is a little less satisfying. Ray Chase’s world-weary delivery is true to the spirit of the story and tone of the writing. His acting—the way he delivers lines of dialogue—is superb. But, in a tale that includes Englishmen, an Irishman, a Welshman, an Indian, Spaniards and men and women, one has a right to expect an attempt at different accents and distinctions of gender. Lacking that, it’s easy to forget who’s talking. And even easier to realize you need to hit the rewind button again.